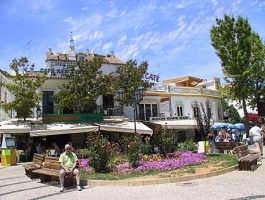 Albufeira is without doubt one of the major tourist resorts in the Algarve. It covers an area of about 140 square kilometres and is located in the centre of the Algarve, close to the end of the new Motorway to Lisbon. It has a permanent population of 30,000 residents, which increases significantly in the summer months. Albufeira has many apartments and villas for holiday let. There are also always a wide selection of properties for sale for all budgets. Ranging from old and new villas, to fishermans's cottages to budget and luxury apartments including ones in the spectatular new marina. 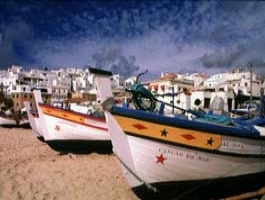 Albufeira has a long and varied history, and has been influenced by many different cultures. The Romans, who named the town Baltum, initially settled in the town. A hotel in the centre of the old town retains the name. Trade with North Africa led to a large number of Moors coming to the Algarve, who gave Albufeira its current name. The moors knew the town as Al Buhera, or castle of the sea. The Moors were finally left Albufeira in 1249, after a seige by the knights of the order of Santiago. It then became part of the kingdom of Portugal. It was awarded a charter on the 20th August 1504. This date, now a public holiday, is celebrated every year with fireworks at midnight on fisherman’s beach. A large proportion of the town was destroyed in 1755 by a large earthquake and tidal wave. It took many years for Albufeira to recover, but fortunately it did. Due, in a large part, to a thriving fishing industry that developed in the town. The main town beach is still known as Praia dos Pescadores or Fisherman’s Beach. The colourful boats can still be seen moored on the beach. With the arrival of tourism in the 1960's (The oldest English bar, Sir Harry's, in the old town square, was established in 1966), the town continued to grow. The old buildings took on new uses, for example the old port wine cellar became a beautiful restaurant, cave do vinho do porto, featuring live music. Albufiera became a city in 1986. A marina was completed in 2005 and the whole of the old town was redeveloped in 2006. 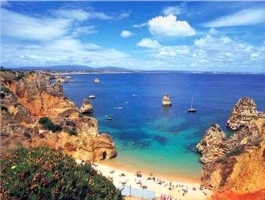 Albufeira has many beautiful beaches including Falesia, Rocha Baixinha-Leste and Oeste, Santa Eulalia, Belharucas, Oura-Leste, Maria Luisa, Oura, Aveiros, Sao Rafael, Evaristo, Manuel Lorenco, Gale-Leste and Olhos d'Agua. All of which have a blue flag.